B&O BeoPlay H3 ANC review | What Hi-Fi? Paying £200 for a pair of in-ear headphones is no small ask, but then B&O isn’t exactly a company that concerns itself with budget. In fact, amidst a range of £1,800 soundbars (BeoSound 35), £7,000 TVs (Beovision Avant 55) and £50,000 speakers (BeoLab 5), B&O has actually managed to make the Beoplay H3 ANC headphones look like a bit of a bargain. Like most B&O products, the Beoplay H3 earphones certainly don’t scrimp in the design stakes. Each earbud features a brushed metal outer casing made from a single piece of aluminium, with 29 precision-drilled holes that B&O says work as air vents for a more natural sound reproduction. The metallic construction makes them feel pretty sturdy too, but not heavy. 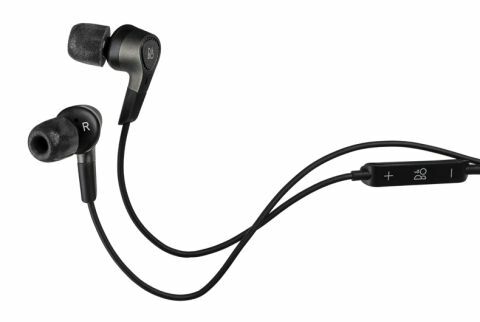 In fact the B&O H3 earphones weigh just 40g and never feel cumbersome in your ears. They come with Comply memory foam tips already on – our pick for a really snug fit – but there are also four silicone tip options in the box, alongside a carry case, a micro USB charging cable and an airplane adapter. The big difference between the B&O H3 ANC and the original B&O H3 earphones is the active noise cancellation, as made obvious by the circular control unit built into the cable. It’s a pretty chunky unit, but because of its placement by the jack, can easily be tucked away in a bag or pocket along with your device. MORE: What are Apple Lightning headphones? Turned on and fully charged, the B&O H3 in-ear headphones will provide a quoted 20 hours of noise cancellation, but if you run out of juice mid-commute, the H3s can be used passively too. The cable is a little thicker than the original H3s, but still features the same in-line controls for taking calls and adjusting the volume. The noise cancellation is very subtle indeed, and it will dull the noise around you rather than block it out completely. That can help drown out the sound of public transport, but don’t expect it to make much difference to office chatter. Keeping noise-cancellation turned on, we put the B&O H3 ANC earphones through their paces with a blast of Dead Editors by Massive Attack. It’s a rich, full-bodied sound that works perfectly with this track, the pulsing bassline is packed with weight and authority that makes for a solid sound throughout the frequency range. It’s not overpowering though, and the H3s are actually pretty well balanced, serving up a good level of detail and insight into the midrange that ensures instruments sound natural and lifelike. A listen to Lenny Kravitz’s Frankenstein helps to emphasise the H3’s good grip on timing and organisation too. Ambitious harmonica and saxophone solos sit pretty over the top of the song’s foot-tapping percussion track, and the H3s never miss a beat. Lenny’s passionate vocals could have a touch more expression to them though, and the drums could kick with more bite. In fact, the whole presentation could do with more punch and articulation – it’s just a touch too easy-going for our taste. With ANC turned on, there’s more excitement from the presentation, thanks to a slightly boosted treble, but this does make for a less comfortable listen over long periods. When your environment isn’t noisy enough to really need the more upfront character, we’d keep it turned off. While the B&O Beoplay H3 ANC in-ear headphones don’t quite get the balance between excitement and easy listening right, they do a fine job at giving enough by way of detail, timing, weight and authority to make up for it. We’d like a bit more attack to their character for the full five stars, but it’s otherwise a commendable balance that works well across different tracks and genres, and makes these in-ears well worth considering.